Originated about 1850 on the farm of John Huntsman of Fayette, Missouri, and was widely grown in Kansas and Missouri. Although prized for its fresh eating qualities and the vigor and productiveness of the tree, it was never widely sold in the South. Fruit is large, somewhat roundish with unequal sides. 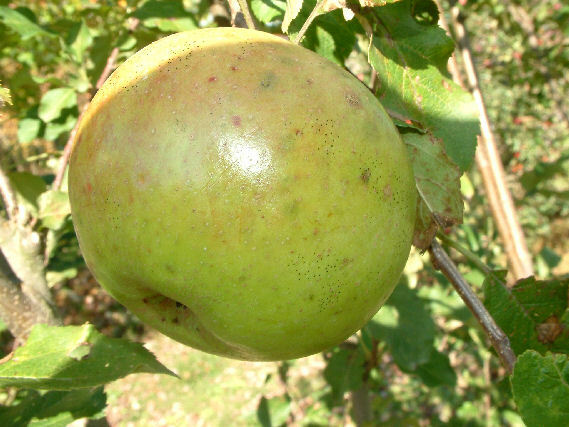 The smooth skin is deep yellow with an occasional reddish-orange blush and large, dark, distinct dots. The firm yellow flesh is juicy, aromatic and very flavorful. Ripens in September and is a fairly good keeper.